The moment Steam emails me that it's out I am jumping in. It's the next big MMO/Rust-wannabe, so it's January's biggest game for me. Whoever doesn't mind risking $30, you are welcome to join me right away. Everyone else should wait until I report back, because these extremely ambitious games are also extremely difficult to get right, so chances are good it'll be a waste of money. The upshot is that if it's good it will be heaven, in which case you'll want to jump in asap because the good times are to be had when we're all playing it together, and before we've had enough of it and you end up playing alone. By all reports, they are mini-games based off the main game's engine for a quick cash-grab to fund the MMO's development. This game is completely bias in favour of the guilds who took part in the first Beta Test. A friend and myself have played YO PvE only. We joined the MMO 6 weeks ago, everything seemed fine to start, meeting different people etc. The spot we chose to settle in was controled by a large alliance. Not a problem, pay tribute to the local king for his protection. That's easy! Things were going well, we gained a few new members and started progresing with our settlement. The King asked our Leader to join his alliance, it seemed the thing to do so we did. They were at war with other alliances, we knew that. We were attacked multiple times from members of these alliances. Ok so it just got a little harder to skill up and build but we knew that would happen. All resource is controlled by large guilds. we have had some success but not enough. Each death is skills lost and the enemy (one in particular, know this) They butcher us with ease take any items that will hold us back, food/boards/shields etc. One of the guilds from the enemy alliance has taken this to the point of bullying 6 attacks in the last 90mins our Blacksmith has now quit playing as two deaths took a weeks grinding skills away, two others payed to start new characters away from this. The other members are saying that it is not a fun game to play. I understand it's a PvP game but give the new guy's a chance to equip and defend. And put a stop to the bullying! it is not how raiding/war is done. I would not recomend purchasing this game to anyone! Refreshingly Violent™ wrote: Where is your king now ? Where is his support to you? Dont you pay something for him ? You know they are at war. Why did you join the Alliance ? War isnt easy, and war comes along with losses. For me, your king is just a stupid fat piece of meat, who wants you as his meatshield to have his own assets safe. Time to move along, gather everything you need and search for another spot or another alliance. Cerne Abbas wrote: Read my comment correctly. You will see I accept raids, its the bullying I have issue with. Deal with it, cause Life is Feudal. [=Æ=] kingfish wrote: Just join Epleland. It's the RP server and better anyway. Guilds "own" whatever they can patrol and KOS inside of. I mean you want a medeival simulation? Here's a game where the penalty for cutting down the wrong tree will get you killed. Just like poaching in the king's forest would get you executed in ye olden times. Seriously. It's a game that let's you experience the absolute paramount need for banding together in larger groups in a true survival situation. This is exactly what people did around the year 1000. No one lived alone in a forest. It would be suicide. But yeah what the last guy said is the essence of the game. If you aren't big enough to call the shots, then you find someone you can tolerate who can call bigger shots than you and you fight on their side in a grander strategic game. Military alliances and trade collectives are forming on the map already. If you try to do the lone wolf thing, you'll end up steamrolled by forces much larger than yourself. [=Æ=] kingfish wrote: Personally, I think when it releases on steam, you're going to see a lot of towns suddenly double or triple in size as noob peasants get beat up all over the map and start running for whatever walls are closest and begging for assylum. tattooudrew wrote: with the alignment system it really deters alot of greifers, ontop of that in order to get weapons you need several proffesions working together and its not like ark where you can run off an craft some spears real fast. the fights are alot different, in that wounds last for hours if not healed properly, it typically only takes 2-3 hits to down someone, and the group pvp is more organised, and yes large scale pvp happens constantly if your guilds in a coalition at war. this game is meant to be played with others, and encourages large guilds. large fights, and rewards strategy and planning and general good organisation. I watched all the videos on the Steam page. They are incredible, and it sounds like they solved all of Rust's problems. You have terraforming, so you can build whatever you want wherever you want; far more complex construction and crafting, so you don't run out of things to make in two days; fast travel with mounts, but with a huge world that will still take you hours to cross (they say "days", but I am not sure if they mean real-time or in-game); weather patterns; a clear focus on groups, where they don't mince words and outright tell people that solo play isn't survivable; and even mini-games played via smartphones during the day so that you can do your grinding on the subway or something, and save your computer time for big moves with your friends. It could still be a failure and not much fun, but at least it is clear that they have done a lot of thinking on how to make this work, and even if they fail as a whole, I am sure some of their ideas will prove to be successes that others can build on in future. 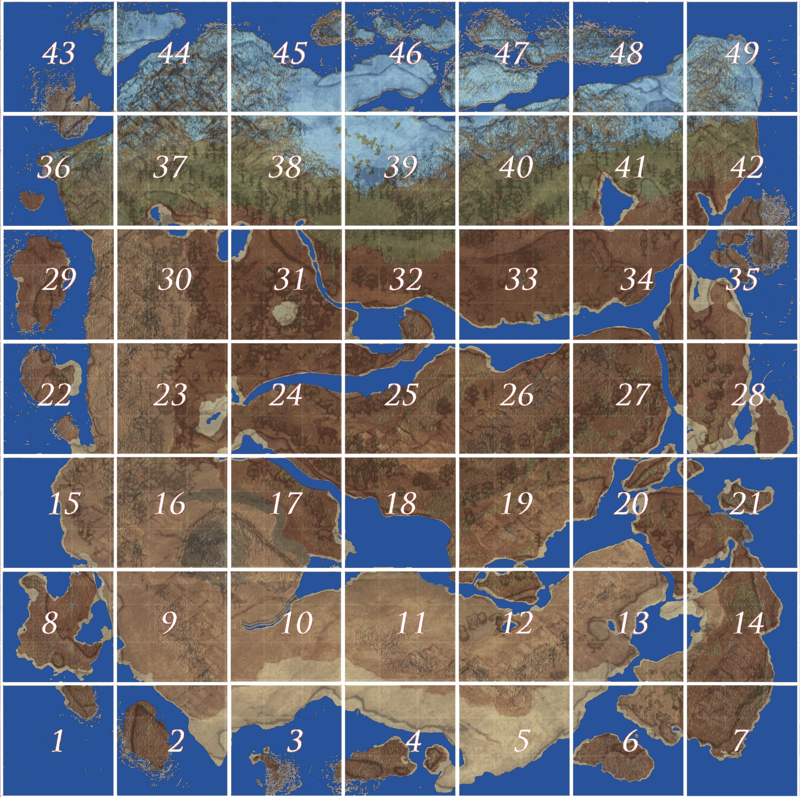 If there's anyone interested in playing, I'm in the NA Telmun server on position 25 of the map below. My claim is at coordinate 4.104:4.46. Just build next to me and let me know what your name is in game so I can add you to my claim. My claim is named the same as my character, Serkr Odhen. For those that are on Buyan, you'll need to transfer to Telmun. The reason for the switch is that it will be almost impossible to hold on to land in Buyan since only guilds can claim land in Buyan, you need ten people to form a guild, the money to upkeep the land, and the appropriate skill level in certain trades to even expand. Essentially, we need a trained army before entering Buyan and we can do it on Telmun.